Facebook, Twitter, Snapchat, Instagram, LinkedIn, Pinterest. What do all of these have in common? They’re tools you can leverage to build your company’s brand. The concept of social media was first introduced in 1997 when Six Degrees was launched. This platform allowed people to upload a profile and add friends – built on the idea that every person in the world could connect by only six degrees of separation. Today, there are more than one hundred social networking sites around the world. People all over the globe can connect via video, photo, instant messaging, chat, and blogging. There are a multitude of different perspectives on social media…some of which are positive, and others that don’t necessarily put it on a pedestal. The amount of information these sites gather from users is a little scary, but that’s not necessarily a bad thing – especially when it comes to building business. Your customers are using social media. If you don’t have a presence on these sites, you’re missing out on building a relationship with a large majority of your customer base. What exactly is social media branding? The key to understanding social media is understanding the art of connecting. Your customers are talking to and about you, and you might not even know it. Social media branding involves leveraging these networks to add personality to your brand. This is done by monitoring conversations, replying to comments, and addressing customer concerns. If customers are talking about your brand online, they’re likely doing one of three things: promoting your company; asking a question; or typing out a 300-word, unedited, brash, and ill-mannered complaint. By maintaining a presence in the same places your customers are, it’s much easier (not to mention, much more beneficial) to thank customers for their support and address those unhappy customers. When was the last time you interacted with a company online and felt as though you were having a one-on-one conversation, with a real HUMAN person on the other side of the screen? It’s important to add that human aspect to your brand online, because it reminds customers you are just like them. It builds and nurtures relationships, letting customers know their feedback is important. Social media branding is such a resourceful practice because it helps you understand your customers on a deeper level. In addition, your customers are getting the information they need and are looking for. Looking for inspiration? 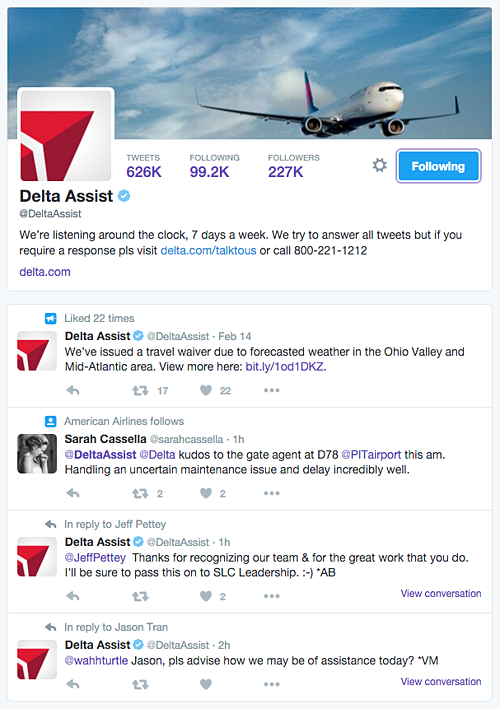 Log onto your Twitter profile and follow @DeltaAssist. DeltaAssist is a strategy the Delta airline implemented to assist passengers already in flight. Whether you need to reschedule a flight, get an update on a connecting flight, or track lost luggage, DeltaAssist is there to address the concern. Delta stands out because they pay attention and they interact with a humanized brand. Social media isn’t just for marketing, it’s also for building relationships. It will help your company build real-life relationships by reaching customers you didn’t have the capacity to reach before. My point? Understand it, leverage it, maintain it. Need more help in social media planning? Download our template below, or give us a call. We're a digital marketing agency that has vast experience in social media marketing and planning.